Technically speaking it is now fifteen accessories (set of four tweezers) and counting and technically each is exactly a dollar at my local Dollar Tree store. But, you get the picture. There are some very useful items that are real bargains that will add enjoyment to your hobby. 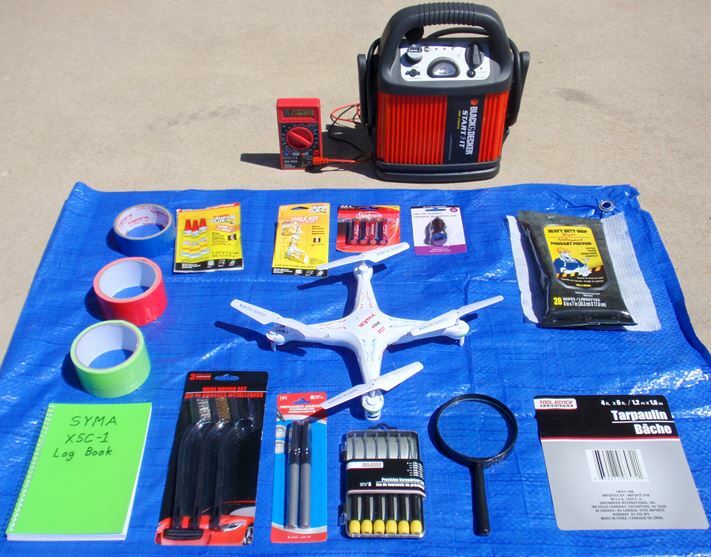 Everything that you see on the blue tarp (including the tarp folded to quarter size) except for the SYMA X5C quadcopter can be yours for just a dollar, plus tax where applicable. Blue masking tape for painting sharp lines or protecting areas. Two packaging types of super glue for small repairs. Package of 4-AA alkaline batteries for use in the transmitter. 12-volt cigarette lighter to 5-volt USB adapter jack. Notice one of these plugged into the cigarette lighter at top-left of jump-starter directly above it. Package of 28 white, handi-wipes for safe cleaning of plastics and hands. Packaging description of the 4’ by 6’ (1.2m by 1.8m) blue tarp. This makes for a sand and grass-free takeoff and landing strip or just a dry place to kneel on while readying your bird. Case of 3 different-sized flat blade and 3 Phillips jeweler screwdrivers. All three of the Phillips type fit the delicate heads of the quadcopter screws better than the included screwdriver. 3-piece wire brush set of stiff bristles for cleaning grit from gears. Log book to keep track of dates and description of motor replacement, battery log, photo locations, etc. Fluorescent-colored, lightweight duct tape for strip wrap-around placement on the rotor pods for determining quadcopter orientation in daylight flights. Also notice above the tarp is my jump-starter for winter car starting that has found summer use as a portable “fuel station” on a trip to the park. It makes for an all-day power source for battery chargers using the above-mentioned USB converter. The digital voltmeter is $6 or less at my local Harbor Freight store and accurately tests battery voltage to the nearest hundredth of a volt. I am sure that if you look around you can find other bargains of great use to your hobby just as I have. It’s all part of the fun!